Much of the problem for true sufferers of OCD are that words like “obsessing” or “being obsessed” are commonly used in everyday language. I have a friend who tells everyone she is “obsessed” with finding the perfect pair of jeans; another “compulsively” checks her hair for gray roots. I, personally am “obsessed” with CBS’s NCIS, never failing to watch a television marathon as well as taping each show of each season. These casual references simply mean a person is simply preoccupied with either a topic, an idea or a person. “Obsessed” in this everyday sense doesn’t involve problems in day-to-day living and even has a pleasurable component to it. You can be “obsessed” with a new song you hear on the radio, but you can still meet your friend for dinner, get ready for bed in a timely way, get to work on time in the morning, etc., despite this “obsession”. In fact, it’s my personal belief that individuals with OCD have a hard time hearing this everyday usage of “obsession” as it diminishes their very real, very painful struggle with OCD symptoms. “Similar to obsessions, not all repetitive behaviors or “rituals” are compulsions. You have to look at the function and the context of the behavior. For example, bedtime routines, religious practices, and learning a new skill all involve some level of repeating an activity over and over again, but are usually a positive and functional part of daily life. Behaviors depend on the context. Arranging and ordering books for eight hours a day isn’t a compulsion if the person works in a library. Similarly, you may have “compulsive” behaviors that wouldn’t fall under OCD if you are just a stickler for details or like to have things neatly arranged. In this case, “compulsive” refers to a personality trait or something about yourself that you actually prefer or like. Fear of touching doorknobs, using public toilets, or shaking hands. 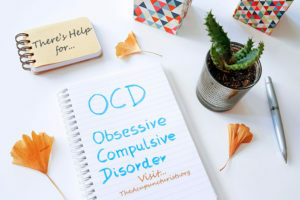 I have had clients – and students – who suffered from OCD in varying degrees; many of them were resigned to their fate, resigned to their medications and resigned to the fact that in varying degrees, their individual social lives were limited. While Western treatment has focused on drugs and talk therapy, for many of the people I worked with, drugs and therapy were not enough. As a mental health practitioner and counselor, I have sat in many CEU classes about OCD. Many of my clients and my colleagues suffer from this debilitating illness. I have learned the recognized prescribed medications and studied the use of conventional, Western talk therapy. Yet, I have to admit that the – for lack of a better word – “precise-ness” – of a TCM diagnosis – astounds my inner scientist. “In Traditional Chinese Medicine, OCD is addressed according to the way it presents and the type of symptoms that occur. It is important to know that more than one organ system imbalance is typically involved with OCD. For example, an imbalance in the Spleen results in repeated and unwanted thoughts. Imbalances in the Kidney result in fear that leads to compulsions or rituals. Fear of dirt or contamination by germs is common in a Kidney imbalance. Additionally, OCD sufferers may have an unhealthy preoccupation with traits that relate directly to a Lung disorder. This would be those who have a preoccupation with rules, schedules and lists and who would be critical and demand perfection. Individuals with a Lung imbalance would be excessively devoted to work and seem emotionally rigid and inflexible. OCD is a very real, very upsetting and unsettling disorder. Research has shown that both Traditional Chinese Medicine and Acupuncture have helped many people with OCD, among other psychological conditions. Most of us are unaware that TCM can be a viable treatment. As advocates for our own health care, it is imperative that we know all that we can about complementary health care treatments. If you or a loved one is suffering from OCD we want you to know that there is help. Call and schedule with one of our skilled, experienced acupuncturists today and receive a free consultation. We serve the communities of Coral Springs, Coconut Creek, Margate, Tamarac, Parkland, Deerfield Beach and West Boca.